At the beginning of the second part of his Trattato dell’imbrigliare, atteggiare e ferrare cavalli (Treatise on bridling, training and shoeing horses, 1556), Cesare Fiaschi explicitly states his intention of codifying the equestrian art of his time, setting the rule for the proper execution of the different “maneggi”. A rule which, in the author’s intention, served also to safeguard those who applied it from the criticisms of the many riders who at that time, rode without due accuracy. The part of Fiaschi’s treatise specifically dedicated to horse riding can, in fact, be considered as a canon of the different exercises performed with a horse which has already been perfectly trained. However, the author says very little on how the animals were prepared to perform these refined movements. 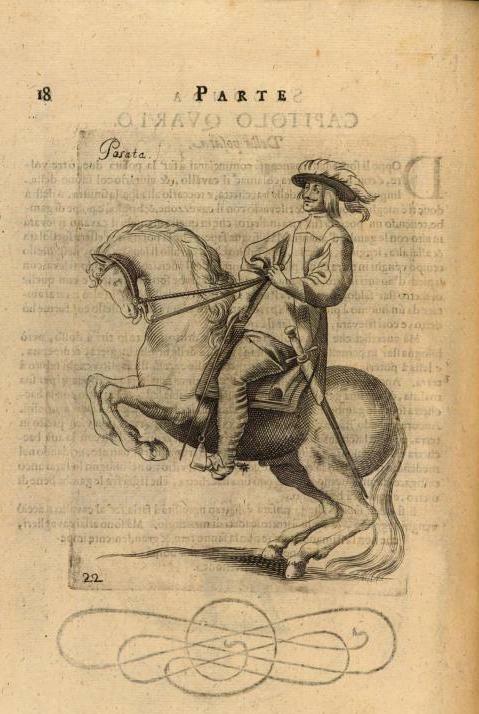 From the point of view of horse training techniques during the Renaissance, two other fundamental texts of the sixteenth century are more interesting. 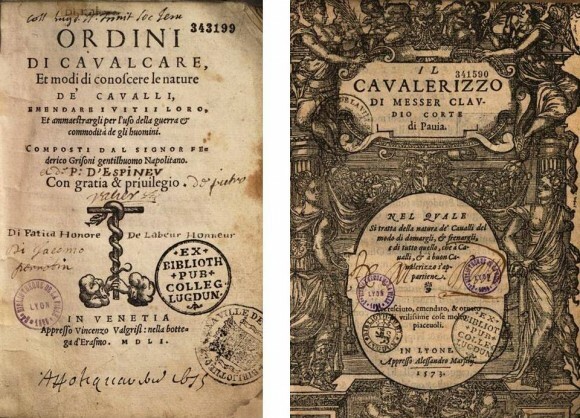 Namely, Gli ordini di cavalcare (The orders of riding, 1550) by Federico Grisone, a kind of real manual for the training of the horse “to the use of war,” and Il cavallarizzo (The Horseman, 1562) by Claudio Corte, one of the most refined and innovative works among those devoted to the equestrian art in the sixteenth century. According to Grisone, the horse had to be tamed when he was at least three years old. The training was rather quick and lasted an average of four to six months. Grisone suggested that the horse be ridden initially on a plowed field, where other horses have made a track. In this way, the author argued, the horse was induced to follow a correct path, avoiding the trouble of walking on loose soil. With the progress of the training, a shallow ditch could be used in order to force him to follow an even more rigorous path. to follow a more rigorous path while performing the passade. According to the Neapolitan author, the so-called “torni” were essential to prepare the horse to perform the “maneggi”. 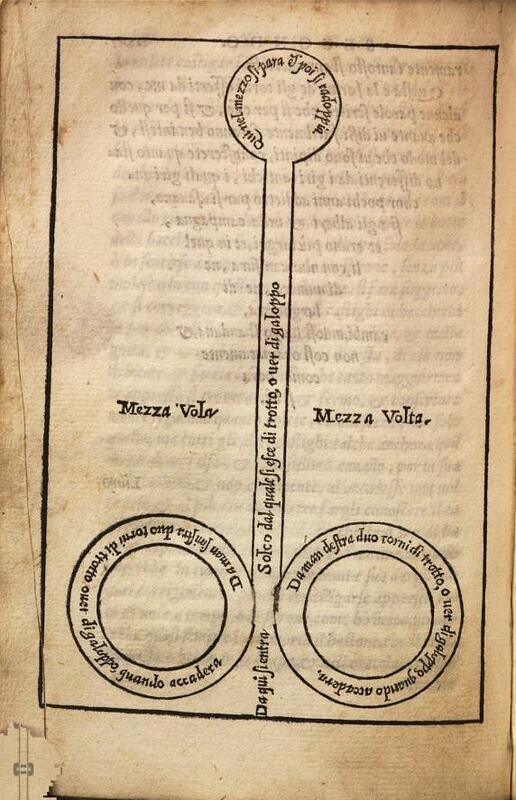 They consisted in making two circles (“volte”) to the right and then, two circles to the left, followed by going along a straight line (“repolone”) after which the horse had to be stopped performing some pesades (“posate”). Then, when the horse was “quiet and proper”, he had to make two narrow voltes to the right, then two to the left. With the progress of the training, the rider had to have the horse perform one or two pirouettes (which Fiaschi and Grisone call “doubling”- raddoppio – or “doubled voltes” – volte raddoppiate). Finally, the animal was led back on the straight line and “went out” of the “torni”. The exercise was performed initially at the trot and then, in a more advanced stage of the training, at the canter. The “torni” were used to train the horse to find his balance under the weight of the rider, in order to teach him how to run the repolone (or passade), stopping after the charge and turning on his haunches, and cantering again in the opposite direction. To help the horse to become accustomed to facing battle on any kind of soil, Grisone also suggested placeing stones on the path. The author insisted on the importance of training the horse to stop straight, perhaps even with the help of a man on the ground who put him into frame with a stick. For the same purpose, he considered it useful to rein back. At the first stage of the training, the horse was mounted with a cavesson and a curb bit. Then, when he was already trained at a trot, Grisone suggested to take away the cavesson and to use the so-called false-reins, namely additional reins which were secured to special rings on the bit’s shanks, at the ends of the mouthpiece. The bridle then functioned like a pelham bit (1). This use was harshly criticized by Fiaschi, who considered it harmful to the horse. The pesade was considered essential to accustom the horse to stop carrying his weight on the hind legs. Soon the horse was taught the “pesade” (posata), that is to say to bring his hind legs under his body, lowering his hips and lightening the front legs so as to lift them from the ground. This technique made ​​it possible to collect the horse to the extreme, making him capable of a rapid change of direction at the end of the “repolone”. It was also a spectacular exercise which was used as a presentation air. Compared to Grisone’s book, the work of Claudio Corte introduces various other training exercises, the most part of which are still used today, even if with slight differences. Clearly, these were not invented by Corte, but he had the merit to explain them in his treatise, consolidating their use. 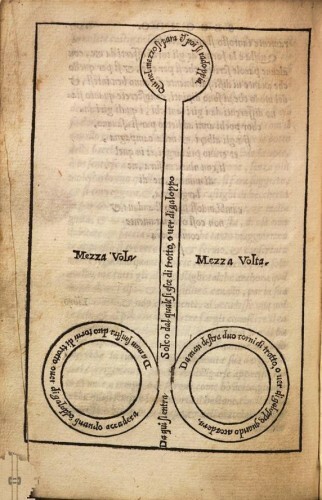 According to Corte, the starting point of the training is the work on the circles. Therefore, he proposed an updated scheme of Grisone’s “torni”, which he calls “rote” (“wheels”). The difference between the two exercises is that, after covering the straight line, the horse had to turn on three contiguous circles with a diameter of 8-12 meters(26-39 feet), then he had to come back on the same straight path, after which he had to turn on three smaller circles (of about 6-9 feet in diameter). to make the horse supple and obedient. After confirming the horse in this exercise, Corte suggested to start him to another one: the so-called “caragolo” (from the Spanish “caracol”, i.e. snail). 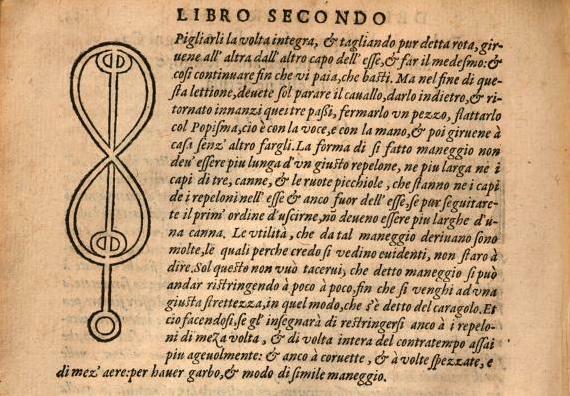 It was about performing a spiral then, after covering a repolone, performing another one in the opposite direction. 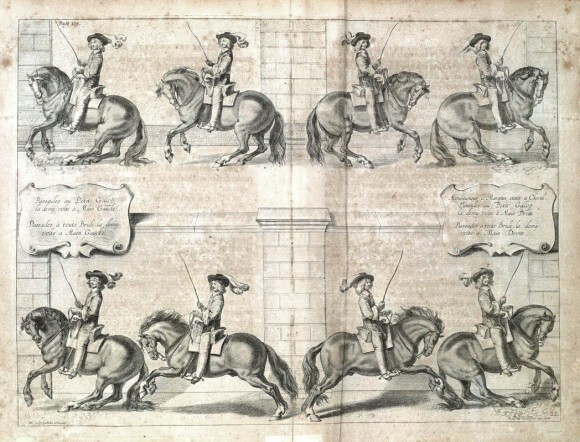 Corte considered this the most important and effective exercise, capable of producing the same benefits of the work on the “rote” (circles), but allowing the horse to become more agile in a shorter time. After a certain amount of training, the horse had to perform it also at the canter. 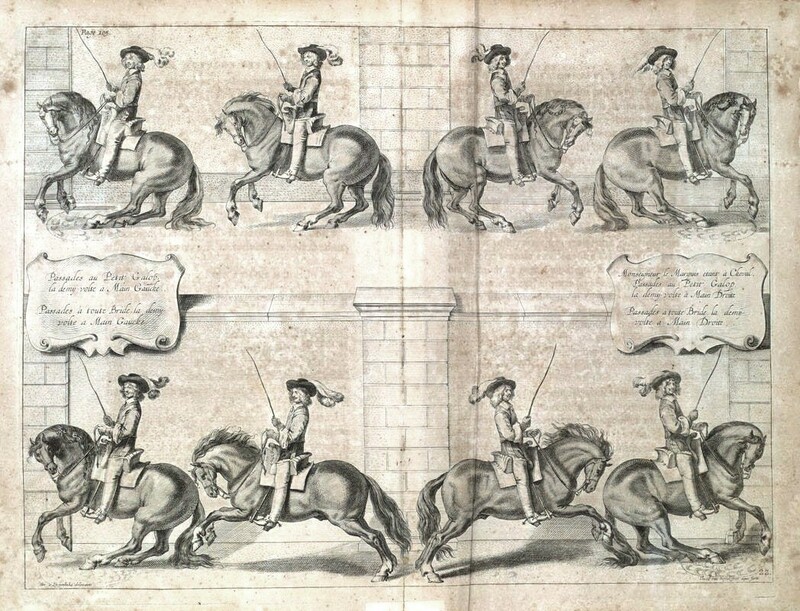 According to Corte, at that point, the exercise also assumed a significant aesthetic value, demonstrating the docility and the smoothness acquired by the horse and the skill of the rider. Another innovative exercise is what Corte called “esse serrato” (tight S). 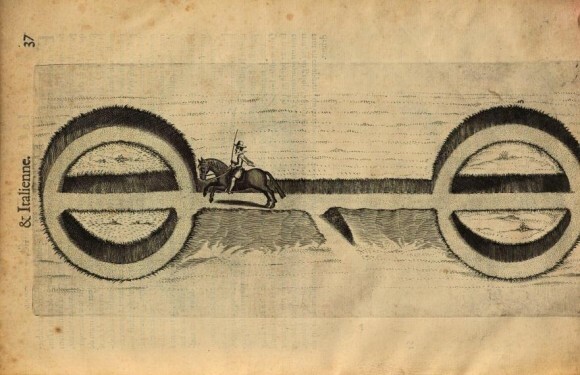 It was a path in the form of a figure eight, from which the rider comes up with a repolone, stopping the horse on the straight line. The author recommended performing it initially on a wider path, which was gradually reduced as the horse became accustomed and more dexterous in turning. Among other things, it was considered a prerequisite to the repolone (i.e. to the passade). 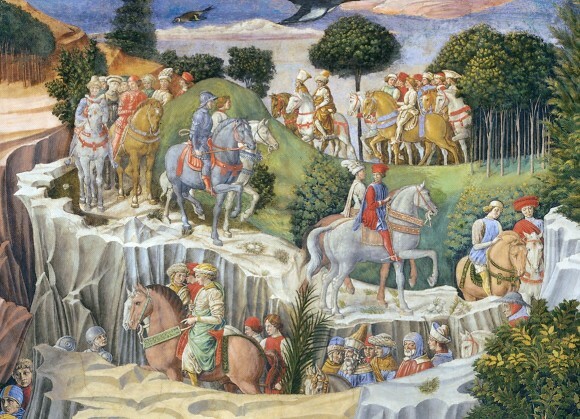 Curiously, Corte argued that the most generous and noble horses were pleased to perform the serpentine. Finally, the last exercise introduced by Corte was what he called “to snake” (“serpeggiare”), i.e. the serpentine. It was, he said, a kind of training suited to promote the balance of the horse and his obedience to the bit and to the legs. The author considered it also useful to avoid firearms shots in battles and, argued that horses, especially the most generous and noble, were pleased to do it. He added that, unfortunately this exercise was generally neglected in the riding schools, where courbettes and pesades were mainly taught. Corte was also the first author to mention the use of the work in-hand, with the rider on the ground who guides the horse with the reins. Over time, this way of training the horse would subsequently have a remarkable development, being used to teach the horse the different exercises of dressage without the hindrance of the weight of the rider. Corte recommended it for training the horse to rein-back. If the animal resisted the aids of the rider, he had to dismount and, taking in each hand the reins of the cavesson, he had to push the horse “pleasantly” back until he understood what he had to do. As soon as the horse took a few steps back, the rider had to get back in saddle and ask the horse to rein-back. 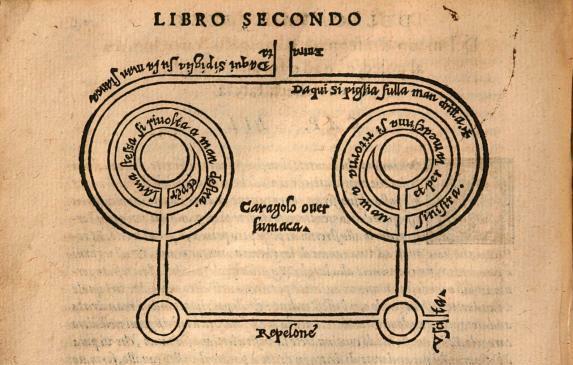 If again he resisted, the rider had to repeat the exercise from the ground: “that you have to be very sure that doing so in two or three mornings, and even in less than an hour, you will have him at this” (CORTE, 1562, II, 8, p. 66v). 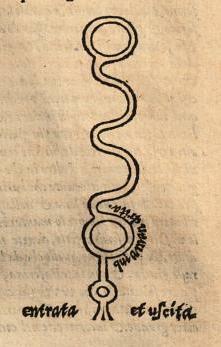 (1) Grisone and the other Renaissance authors do not describe the false-reins, but we find their description in later editions of the treatise by the Duke of Newcastle: “To work Horses with false Reins, is very false working, for, being tied to the Arches of the Bitt, and pulling it, that flacks the Curb: and so no Horse shall be firm and settled with it, for, that Horse that doth not suffer the Curb, shall never be a ready-horse; so it makes the Bitt like a Snaffle” (I quote from the English edition: William Cavendish (Duke of Newcastle), A New Method and Extraordinary Invention to Dress Horses, etc, Dublin, James Kelburn, 1740, p. 277). I owe this information to Michael Stevens, who has friendlily pointed out an inaccuracy in the first version of my article. Having such attentive and competent readers is a privilege and an honor to me.